The federal Tax Cuts and Jobs Act, enacted just days before the New Year, contains sweeping changes for individuals, for corporations, and for the work of charitable nonprofits. The changes create immediate uncertainty about what nonprofits must do now to comply and what changes state and local governments will likely make in response – such as changing their own tax codes and making spending cuts, perhaps in ways that will affect nonprofit missions if nonprofits fail to step forward to protect themselves. Register now to join a free nationwide webinar presented by the National Council of Nonprofits, Now What: How the New Federal Tax Law Impacts Charitable Nonprofits, on Thursday, January 11, 2018 at 3:00 pm Eastern. Learn what operational changes you may need to make right away, what you need to know about related state and local policy changes, and other items that will affect your nonprofit and the people you serve. Omnibus Spending Bill: The federal government is currently funded through a continuing resolution (CR) that is set to expire on January 19. Congressional leaders are working to reach agreement on how much to spend for fiscal year 2018 (which started on October 1) and whether any of the other major issues discussed below can – or must – be included to pass a bipartisan bill. On the spending side, the biggest question is whether to increase just defense spending by $54 billion, add some to domestic programs, or, as Democratic leaders are insisting, provide an equal amount of increases for both defense and non-defense spending. Once the top-level spending decision has been made, appropriators will allocate funding for each of the 12 separate spending measures and package them into one “omnibus” bill. Congress may have to adopt another stopgap CR, perhaps running into February, to give itself time to craft the big bill in a way that can secure enough votes to pass. Healthcare Funding: The CR that Congress enacted in December was supposed to provide enough funding for the Children’s Health Insurance Program (CHIP) through the end of March. But state, and now federal, officials are warning that some states may run out of money in the next two weeks for the program that provides health insurance for nine million children. Separately, Congress is being called on to restore funding for insurance subsidies for low-income individuals that President Trump ended in October, as well as provide temporary funding for reinsurance pools that help insurers pay claims for the sickest – and most expensive – patients. Bipartisan bills are pending on each of these issues. Immigration and Border Security: Congress must decide what to do about the fate of some 800,000 "Dreamers," young people brought to the United States illegally as children, who have been able to remain in the country under the Deferred Action for Childhood Arrivals (DACA) program. President Trump ended the Obama-era DACA program and gave Congress six months to find a resolution before the deportation process would begin. In the spending bill negotiations, the Administration reportedly is seeking a deal on DACA that also provides funding for construction of a southern border wall to deter illegal immigration. Disaster Assistance: Before leaving for the holidays, the House passed an $81 billion disaster relief bill to help communities affected by recent hurricanes in Texas, Florida, Puerto Rico, and the U.S. Virgin Islands, as well as wildfires in California. Passage in the Senate is likely, but the measure is caught up in the wrangling over an additional CR, the omnibus spending bill, and other priorities. Johnson Amendment: Language to politicize charitable nonprofits, houses of worship, and foundations was stripped from the tax bill, but the well-funded lobbying groups seeking legislation to repeal or weaken the Johnson Amendment have vowed to ramp up their efforts this year. Their first opportunity is the omnibus spending bill. That legislation could include language to block enforcement of the Johnson Amendment against even the most egregious violations by “churches,” as passed by the House in September in an earlier appropriations bill, or new language expanded to cover all 501(c)(3) organizations. See GiveVoice.org for more information on actions to take to preserve nonprofit nonpartisanship. The end-of-the-year giving season is over and the Tax Cuts and Jobs Act has now taken effect; so what’s the real effect on charitable giving? The majorities in the House and Senate rejected data from experts showing significant losses of more than $13 billion annually in giving to charitable works, preferring their own assumptions that people will donate more if they have more money. No one knows with certainty how much Americans will give or not give. It is indisputable, however, that the cost of giving to charitable nonprofits went up for millions of taxpayers who will no longer itemize their deductions. A $3,000 charitable contribution given in 2018 by a person in the 22 percent tax bracket who doesn’t itemize will cost approximately $3,845 in pretax income. A person in the 37 percent bracket making the same $3,000 contribution and itemizing the deduction will see a cost of only $1,890. That’s nearly a $2,000 difference between the less-well-off and the rich for the same $3000 received by a charitable organization. The less-well-off need a break, too. Charitable works in local communities need and deserve an even-handed incentive for all to give; all American should receive a charitable giving tax incentive. Association Health Plans: The Department of Labor (DOL) issued a proposed regulation last week that would expand the use of association health plans (AHPs). AHPs are arrangements through which multiple small businesses or nonprofits with a "commonality of interest" may set up a group health insurance plan that may be less expensive than individual employers could negotiate on their own. The draft DOL regulations propose loosening the "commonality of interest" rules for AHPs by allowing plans that serve employers in a state, city, county, or a multi-state metro area, or all the businesses in a particular industry nationwide. Critics are wary about whether the plans will provide adequate protections for consumers. Public comments are due in early March 2018.
Business Mileage Rate Goes Up: The IRS announced that the standard business mileage rate has increased to 54.5 cents per mile in 2018 (up from 53.5 cents per mile in 2017). Many nonprofits use this rate when reimbursing their employees for work-related driving. The volunteer mileage rate – the amount that's tax-deductible when volunteers drive on behalf of charitable nonprofits – remains statutorily set at 14 cents per mile and can only be changed by Congress. A provision in an earlier draft of the tax bill would have adjusted the volunteer rate to inflation, but the adjustment didn’t make it into the final legislation. January marks the beginning of legislative sessions in 38 states, and the impact of the federal tax bill enacted just two weeks ago is top of mind for governors and legislators. Forty states link their tax laws to the federal code, yet the federal changes will affect states differently and lead to varied responses by legislatures. For instance, the standard deduction in 12 states automatically went up on January 1 because their tax codes follow the federal standard deduction; eight states match the federal personal exemption, which has now been repealed. The National Conference of State Legislatures identifies the changes in the standard deduction and treatment as pass-through entities as potential state revenue reducers. The change in personal exemptions, a revised formula for calculating inflation, and adjustments to other deductions are potential revenue raisers. While a few state governments, such as Colorado and Michigan, may initially see increased revenues due to how their tax laws interact with the Internal Revenue Code, many more states are predicting losses in tax receipts that could affect their current year budgets and require immediate changes to balance their budgets. Any one change to federal tax law can knock state budgets out of alignment, and states are in no condition to absorb revenue losses. In 2017, 22 states suffered revenue shortfalls, making them unable to maintain services at existing levels. For instance, the ongoing Illinois budget crisis is legendary, while New Mexico and North Dakota are mired in at least their third straight year of spending cuts. Kentucky has a $1 billion budget hole and is already cutting human services, and Iowa expects to make cuts of between $45 - $90 million by June 30. Oklahoma doesn’t even have a budget for the Fiscal Year that started July 2017. And the list goes on. Although the donations-in-lieu-of-taxes approach would not directly affect charitable nonprofits, it does raise numerous questions of unintended consequences. Would payment of taxes through such a process unnecessarily confuse donors about the independence of true charitable organizations? Could it cause “donor fatigue” or undue competition between governments at various levels and frontline nonprofits? Is it likely to encourage policymakers to reduce funding for critical public programs and lead to greater dependence on foundations to support charitable operations? We’d like to know what readers think: please drop us a line. As state and local governments and nonprofits continue to struggle with declining resources, Illinois' 2017 Annual Report on the Grants Accountability and Transparency Act (GATA) identifies millions of dollars in savings and cost avoidance realized through grant/contracting reform efforts. For 2017, Illinois reports estimated savings or cost avoidance of more than $236 million. The most significant savings came from adopting a unified audit approach ($183 million) and following the unique Illinois process of centralizing the negotiation of indirect cost rates (saving $35 million). Other important savings or avoidance of costs came in the areas of a centralized framework for risk assessments ($8.5 million), online grantee pre-qualifications ($4.4 million), and automated notice awards ($2 million). Many of the reforms were made possible because Illinois, through GATA, adopted the federal grants reforms from OMB Uniform Guidance, enabling the state to streamline operations into one set of policies and procedures for grants and contracts with nonprofits, regardless of their funding source. The grantmaking reforms adopted by Illinois provide a roadmap for other states, and the new report shows that governments can reduce costs while maintaining and even improving essential services through the work of charitable nonprofits. Has your nonprofit board done what it takes to earn the prize for advocacy engagement? This is no idle question, because there’s $5,000 on the line for the correct answer. BoardSource, the recognized leader in nonprofit board leadership, training, and data, has created The Stand For Your Mission Awards to recognize the critical role that boards play in standing up for the organizations they believe in by advocating for their organizations' mission. The awards will honor nonprofit boards that have established advocacy as an expectation for engaged and effective board leadership. The winning organization will receive a $5,000 cash award and be featured on the BoardSource website, the Stand for Your Mission website, and in social media. Apply Today! The awards are the outgrowth of the Stand for Your Mission campaign, an ongoing effort to build awareness about the importance of board advocacy to advance an organization’s mission. The goal is to inspire and challenge board leaders to “stand for your mission” through active engagement as ambassadors and advocates for their organization’s work. At the center of the campaign is this definition of nonprofit advocacy -- however one answers this simple question: “Who can I talk to today to advance my organization’s mission?” The campaign highlights success stories, provides ample resources and tools, such as a discussion guide, expectations for engaged leadership, and how advocacy is fundamental to Ten Basic Responsibilities of Nonprofit Boards. 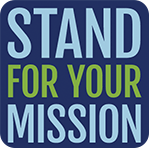 The founding partners of the Stand for Your Mission campaign are BoardSource, National Council of Nonprofits, Bolder Advocacy, Campion Foundation, the Knight Foundation, and United Philanthropy Forum. - Anne Hindery, Executive Director of the Nonprofit Association of the Midlands (NE & western IA), commenting on the above article about the effect of the federal tax bill on states with pre-existing budget deficits. - Chany Ockert, a nonprofit consultant, and Liz Moore, Executive Director of the Montana Nonprofit Association, writing in Voluntary Generosity Is Not Enough, Flathead (MT) Beacon, January 3, 2018. - Rich Ehisin, managing editor, State Net Capitol Journal, writing in With Elections Coming, New Year Could Be Even More Chaotic Than This One, December 29, 2017, highlighting key state issues in 2018, including healthcare, sexual harassment, employment development, and state preemption of local authority. LGBTQ nonprofits fear 'disastrous' losses under new tax plan, Julie Moreau, NBC News, January 6, 2018, reporting on concerns about the impact of the tax bill on charitable giving and quoting extensively from Tim Delaney of the National Council of Nonprofits. The Biggest Issues for States to Watch in 2018, Governing, January 2018, providing a comprehensive overview of state legislative action in the New Year on such issues as the impact of the federal tax bill on state tax laws and revenue projections. A prediction for nonprofits in 2018, Gene Takagi, LinkedIn, January 1, 2018, predicting that the number of 501(c)(4) social welfare organizations will increase as a result of the new federal tax law because donors that will no longer be itemizing their charitable deductions may switch their support to organizations that can engage in partisan activities and unlimited lobbying. New Tax Law Brings Penalties for Top Paid Non-Profit Executives, Tyrone Thomas, Aiden Bianchi, and David Lagasse, National Law Journal, December 31, 2017, providing an overview of the tax law on intermediate sanctions and the workings of the new 21 percent excise tax on nonprofits paying compensation in excess of $1 million. See also, The Impact of the Tax Cuts and Jobs Act on Nonprofit Salaries, Rob Meiksins, Nonprofit Quarterly, January 3, 2018. How will tax reform affect charitable giving, NJTV, December 27, 2017, interviewing Linda Czipo, President of the Center for Non-Profits in New Jersey, about the new federal tax law, the economy, and the need for nonprofits to come together for problem solving and advocacy. Tax Cuts and Jobs Act: A Nonprofit Analysis of the Final Tax Bill, National Council of Nonprofits, updated January 5, 2018, laying out the key components of the tax bill and how they affect the work of charitable nonprofits. Federal Tax Reform and the States, National Conference of State Legislatures, providing a review of the new federal tax bill provisions that may increase or decrease state revenues, identifying the states that conform their state tax codes to the federal code, and cataloguing published analyses by a few state revenue departments on how their states will fare. Does Your State’s Individual Income Tax Code Conform with the Federal Tax Code?, Nicole Kaeding, Tax Foundation, December 13, 2017. Through 2017, Congress passed and the President signed just 97 new laws. The states, on the other hand, were extremely busy, enacting 17,301 new laws by one count, with most of those getting final approval between March and June. Sources: Thomas.gov listing of public laws; search of Quorum legislative tracking service.